King Prajadhipok of Siam (wearing glasses), M.A. 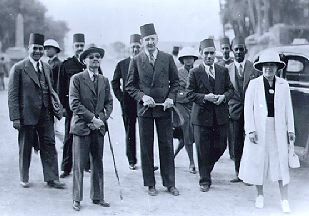 Mansoor (to the King's right), Professor Chevrier (to the King's left), and other dignitaries. The Scandal of the Century - The Mansoor Amarna Exposé is the factual story of The Mansoor Amarna Collection. The controversy over this collection involves Egyptologists, scientists, and museums from around the world. Ms. Mansoor wrote this book to expose the unscholarly and tyrannical control that a few scholars have on the art world and our perception of the shape of past civilizations. The public should be made aware of their influence, indicates the author, so that some protection is established for our ancient heritage. This exposé concerns a collection of 106 limestone sculptures and fragments, dating from circa 1350 B.C., representing the beautiful Queen Nefertiti, King Akhenaten, and their family. The author's family has spent over forty years fighting to prove the authenticity of their collection. The author points out that they wouldn't have wasted their time and energy on that fight if they weren't absolutely sure of the authenticity of their sculptures. A former associate producer of a top network news feature TV show, the author brings her considerable skills at investigative reporting, research and writing to bear on this report. The entire text is available on the Internet. See below. Chapter 11 A "Splendid Galaxy of Expert Opinions"
Chapter 17 "Je Cherche un Homme. . . "
Chapter 29 An Egyptian Fairy Tale: "A Clever Forger"
Chapter 31 A Gift to the Louvre - "Je Vous Remercie . . . Pour Cet Enrichissement des Collections Nationales"
Letter from Dr. Richard Trapp, Professor of Classics, Emeritus, San Francisco State University to Christine Mansoor upon receipt of the book manuscript. Letter from The Honorable George Xanthos, Judge of the Superior Court, State of California.